Body Tracker is an app that is developed for individual users and for trainers. It includes seven body fat calculators, record tape measurements, macronutrients, and pictures as you lose body fat. Our App is Universal, which means it works for both iPad and iPhone. Retrieve or store data with HealthKit. All you need is a tape measure, fat caliper, or body fat scale, and Body Tracker will show you exactly how to take your measurements using seven calculators. Just enter your measurements in our calculators, and Body Tracker will do all the calculations for you - and save your results. If you don't know how to take caliper or tape measurements, just view the images or video included within Body Tracker. Body Tracker provides a detailed diagram and video showing exactly how to take you measurements with a fat caliper or tape measure. 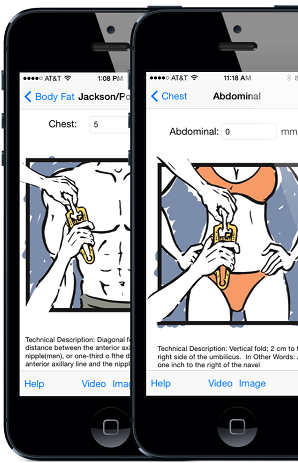 Even if you've never done it before, Body Tracker will explain how to accurately and easily use our app. After entering your body fat measurements and using the calculators, Body Tracker will calculate your body fat percentage, how many pounds/kilograms of your body is fat, and how much of your body is lean body weight. In addition, Body Tracker's fat composition screen has a body fat percentage chart to help you determine what your body fat percentage means to you. Don't forget to let your friends know that you're reaching your goals through our Facebook and/or Twitter buttons for easy bragging! On the profile screen, you can view your most current measurements all on one screen. Your current body fat percentage, body weight, and goal are displayed at the top. Compare your current measurements with your last recorded measurements to see if you are heading toward your goal. Select a goal - either a body weight goal, a body fat percentage goal, or a lean body weight goal - and Body Tracker will tell you what you need to do to reach your goal. You might only calculate your body fat percentage once or twice a month, but you may want to record your body weight more often. You can record your weight daily, or more often if you wish. Add notes to your weight, like if you want to make a note that you had a salty meal the evening before or if you are changing your workout routine. Use the tape measurements screen to record your tape measurements for different body parts. You can record in inches or in centimeters. In combination with body fat percentage, tape measurements will help you track your progress as your body composition changes. Seeing pictures of yourself as you are losing body fat is the best way to measure your progress. View your picture in Body Tracker along with your correlating body fat percentage. Save up to six pictures per date and swipe through to see your progress. What are you eating to gain muscle and lose body fat? 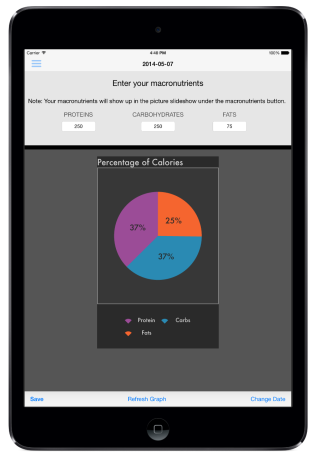 Enter your macros in Body Tracker -- how many grams of fat, protein, and carbs you are eating. This will help you adjust your diet to achieve your weight loss goals. Use Body Tracker BMI and BMR calculator to calculate your body mass index (BMI) and basal metabolic rate (BMR). What is BMI Calculator? BMI only takes a person's height and weight into consideration, but not body fat percentage. Two people with the same height and weight will have the same BMI, even though one of them might have a much higher body fat percentage. BMI is only one measure of a person's overall health. What is BMR Calculator? Enter your height, weight, and age, and Body Tracker will calculate your basal metabolic rate (BMR) based on the Harris-Benedict equation. Your BMR is the number of calories your body burns per day at rest. Select an activity level and Body Tracker's calculator will calculate how many calories your body burns per day based on your activity level. Interested in seeing how strong you are getting? 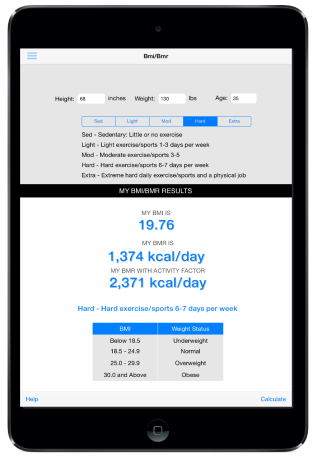 Use the Matt Brzycki One Rep Max calculator for calculating your maximum potential for lifting weights. This is really just an estimate, but is safer than actually lifting your maximum weight on any given exercise. Just plug your numbers in our calculator for any exercise and how many reps you can do with a certain weight and presto! You have an approximate one rep maximum.